I originally started to write this post in June 2017 whilst I was on holiday in Greece. A fierce debate had broken out amongst the blogging world, and I wanted to have my say. I kept that post in my drafts, and then eventually deleted it, because I decided that my mojito-induced holiday ramblings were not appropriate for the seriousness of this topic. So, let me begin with the intention of this being a pretty serious post, with a bit of my own opinion (and a good old joke) thrown in here and there. 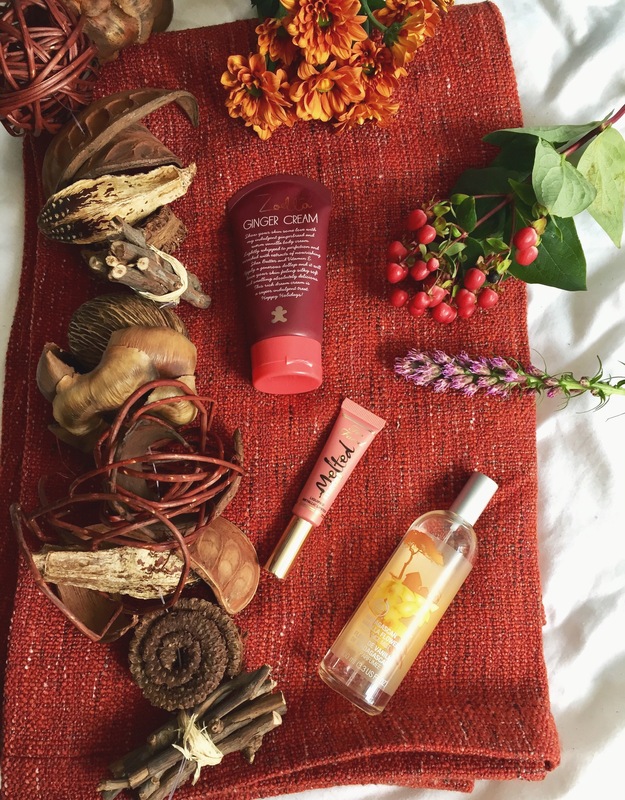 I’ll be honest (and this is really terrible, so judge me all you wish), I had never heard of ‘cruelty free’ before I joined the big wide world of blogging. I knew that animal testing existed (hello, I have seen Legally Blonde 2!) but, in my naivety, I didn’t actually realise that it still happened. To me, it always seemed inhumane and cruel and, also in my naivety, I assumed that others would share my view. Because of how utterly cruel it seemed to me, I just couldn’t comprehend it still happening, so I believed that it didn’t. And I sidled through my life wearing my hoola bronzer on top of my stay perfect foundation, and didn’t realise that animals had suffered for these products. Now, I have a few issues that I’d like to discuss regarding this in this post. I’m going to subtitle them with little headings, so feel free to skip to the one that interests you the most or read them all; whatever tickles your fancy. This is, personally, my biggest issue when it comes to animal testing in the cosmetics industry. Part of the reason why I didn’t even know that it still went on is because brands simply don’t own up to it. For example, this is taken from a brand’s website who I used to really love. Whilst claiming not to test on animals, this brand does admit that it sells their products in China. This means that these products are not cruelty free, because in order to sell cosmetics in China, they must be tested on animals by law. 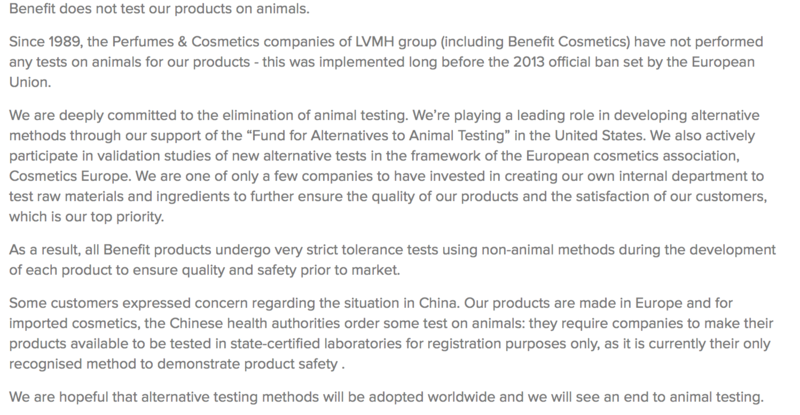 Where you stand on this is completely at your own discretion but, personally, it makes me a little sad that these companies are claiming to be cruelty free, yet make the choice to sell in China in order to benefit (haha, see what I did?) their own profits. To me personally, if a brand was that committed to animal welfare, they wouldn’t choose to sell their products on the Chinese market because of their animal testing laws. But, ya’no, that’s just my logic and thought-pattern, and you are free to make up your own mind’s completely. I don’t think that brands should be allowed to answer these important queries in a wishy-washy format in their FAQs section. I think it should be made much more clear to the consumer, as it just doesn’t seem fair that so many people are unknowingly purchasing goods that are contributing towards the animal testing industry because so many brands try to down play it. You test on animals? Ok, that’s not very nice, and maybe it might put some consumers off of your products but, to be honest, GOOD! At least maybe then you’ll rethink your testing methods. Seriously though, this wishy-washy ‘we care about animals’ FAQs thing that these brands are doing has gotta go. Ok, first thing’s first, I wanna applaud you. You’re doing a grand job. You’re the reason I ever even found out that animal testing still exists. Give yourselves a pat on the back. Some of you are a lil’ aggressive sometimes. And it can get a little intimidating. There has been SO MANY TIMES that I’ve scrolled down my twitter feed and seen cruelty free influencers who have fab cruelty free content, being a little mean to people that don’t always agree with them. I think we gotta realise that an aggressive approach probably isn’t gonna work. In fact, the aggression of some cruelty free influencers (definitely not all) is what put me off making the switch for so long. I felt uneducated compared to them and didn’t feel like I could go to them for help, because it made me feel ashamed that I knew practically nothing about cruelty free beauty. Basically, what I’m trying to say is that an educative approach is always better than an aggressive one! Again, this is something that everyone has differing opinions on. Personally, I will still buy from a company that is cruelty free yet has a parent company that is not. My reasoning for this is that there are so many brands that I love that are (unfortunately) owned by non-cruelty free companies, and it’s a real shame. If a brand is gonna do the CF life, I appreciate that immensely so will not punish them for the values and ethics of their parent companies. And, there’s also a tiny bit of me that hopes that, in doing this, the parent companies will realise that their CF brands are selling better (fingers crossed). I’ll be honest, one of the things that filled me with HORROR about going CF was having to throw my makeup away. I literally thought that the minute I decided to go cruelty free I’d have 30 seconds to say my good byes (like on big brother) before having to evict my makeup collection into the bin. When ya girl’s got £100s of makeup, that’s a little scary. However, I had a mini revelation whilst on holiday that I didn’t have to actually do that. So, basically what I’ve been doing so far is swapping out. I’m still using some of my non-CF stuff until it runs out, and then when it does I’m replacing it with CF alternatives. This way, I get to research a little more into CF products that I would like to try, rather than panic-buying every CF item in boots, and I don’t have to spend a CRAP LOAD of money in one go. I’m liking my system so far. Does it upset me that some of my daily products are not CF? Yes, definitely. But it comforts me to know that once it’s gone I can get a CF alternative, so that’s the way I’m looking at it. Good question Hayley, almost like I wrote it myself (lol). Ok, this is where I’m still not sure. I did accept PR from Rimmel over the holidays (not CF), but I kinda didn’t realise until it had already been sent out to me. It’s a fuzzy line, and i don’t know where to draw it at atm. I have put every effort into working with some FAB Cruelty Free and Vegan brands so far this year (I’ll link these at the end of the post JIC you missed them). I’m not gonna say that I’m never gonna feature a non-CF brand ever again, because that simply isn’t accurate. I am still using brands that have been in my makeup bag for a while that are non-CF, as I said in the point above. So, if I am doing a ‘get ready with me’ or whatever on instagram, these are going to have to be featured, because I haven’t replaced them yet. I try to disclaim this every time I do an insta story but, tbh, it’s a bit annoying so I’ll just make that clear here and now. Am I promoting these products? Well, yeah, kinda. If a product is good, I’ll say it is. But, I always do make an effort to say that it isn’t CF, so I wouldn’t purchase again. As I said a few points previously, I don’t want to force anyone into this lifestyle, instead I choose to educate which is why I like to let the people watching my stories know, so that the decision is theirs. Will I accept PR and gifts that are non-CF? I simply haven’t made up my mind yet. I have not asked for anything that is a gift or PR that is not Cruelty Free, and I have tried to ensure that everything that I accept is CF. But, sometimes things just turn up. I have worked with non-CF brands in the past and it is possible that I’m still on their PR lists, so I’m unsure where I stand on this for now. However, when every product in my makeup bag is officially CF, I will definitely do an everyday routine type post where I show off these products! What did Twitter have to say? I asked twitter about their own opinions on CF beauty, and if it’s something that they actively look for when shopping for beauty products. I know for a fact that many of my followers are not CF, but not many of them chose to comment on this certain situation which makes me a little sad as, I’m afraid, my tweets are a little one-sided. However, like I said in one of my previous points, CF twitter can be a bit aggressive sometimes, so I 100% understand why people who are non-CF chose not to comment. brands big kudos for, it absolutely is a selling point and would make me choose one brand over its non CF counterpart if the product was essentially the same. Absolutely, who gives us the right to use a product that has been forcibly tested on an animal!? There are so many alternatives out there and some are more affordable than you think! It’s personally not something I think about when purchasing beauty products 🙈. Though I know many would disagree with that point blank! I prefer buying from Cruelty Free brands and avoid brands who aren’t. I love animals and don’t believe in a modern world we should be testing on them when there’s other methods that arent harming helpless creatures. We should protect them not harm them. Its deffintly a thing I think I about when shopping! Definitely essential! It might sometimes be a little difficult to find completely cruelty-free products/companies, but I just don’t see it as an option to purchase from a company that tests on animals. Ok, so there we have it. This post is over 2,000 words long, so well done if you made it to this point! If you did make it this far, what are your thoughts about CF beauty/the things I’ve discussed in this post? I’d love to know! Feel free to leave a comment so that we can have a discussion/reply to any comments etc. But (pretty please) let’s have a healthy discussion, inside voices only and no aggression! If you have any CF recommendations, please leave them in the comments so that other people can have a nosey at them! Affiliate links are welcome. I do love a long post and this really delivered. I’m still trying to make up my own mind regarding animal cruelty and veganism and where I stand on it. In particular, I am into K-Beauty and J-Beauty because that works great for me, and I know Korea exports a lot to China but also heard that they plan to make movements in the animal testing/cruelty free area for their entire industry by 2020. So overall, I’m still not sure. I might make small steps towards cruelty free where I can with western brands but I’m afraid it’ll be seen as hypocritical rather than ‘anything helps’. I agree with so many of your points! I will continue to use my non CF makeup because I am working towards a vegan lifestyle, and throwing away lots of products that work perfectly doesn’t sit well with me. I’m really glad that Makeup Revolution/Freedom are easily available and affordable, they have so many good products and dupes, it makes it much simpler to buy CF makeup. To be honest, I am bit in the dark where cruelty-free brands are concerned, but since becoming a little more active in blogging, I am gradually being educated about what “cruelty-free” is and what it encompasses. Since then, I am slowly “revamping” my makeup kit–looking for cruelty free brands. This is really interesting post! I take a brand’s cruelty free status into account when shopping for make up or skincare, but as you have quite rightly pointed out here, it is sometimes impossible to figure out what a companies animal testing policy actually is! The realities, as you’ve highlighted from Benefit’s website, are often masked with a lot of cloak and dagger and as brands change the way they do things and what parent company owns them so often, it’s very difficult to make an informed decision! Like you, joining the blogging community has definitely opened my eyes to cruelty free make-up and although I definitely still have some non-CF products in my very limited make-up collection, I’m not just going to throw those away, I intend to use up what I’ve got left and shop more ethically in future. I can also definitely relate to what you have said about preachy / aggressive people online talking about CF issues – I am all for raising awareness of an issue that’s important to you but I think that this needs to be done in a respectful way! Vegan and cruelty free makeup is so so important. Being vegan is something that isn’t necessarily for everybody but there’s no excuse to reinforce the idea to brands that fur clothing, and products, or cosmetics tested on animals, is ok. By buying, they know they can still get away with it, so they’ll never change their ways, especially if it means keeping a big market like China open. If anyone is interested following this post, feel free to contact me @AFrugalFrenchie or @TheFrugalFrenchie on instagram (and quote this post for a cheeky discount)! What a refreshingly open and honest post. Well done on slowly becoming cruelty free! I agree that brands need to be more open but I can’t see it happening. A bottle of shampoo wouldn’t want ‘1000 bunnies died to make this product’ just like a pack of bacon won’t say ‘made from a 6 month old pig kept between bars”. What I do appreciate is when cruelty free products rant and rave about it as then they stand out and you know they are ethical. You say that some cruelty free influencers can be aggressive but I personally cannot recall seeing any on my feed. There are people who take it too far in all cases though. Try not to let the 1% tar your view of the decent 99%. Keep it up and if you’re ever unsure, just ask with the #cfbloggers tag. Someone will always do their best to help.